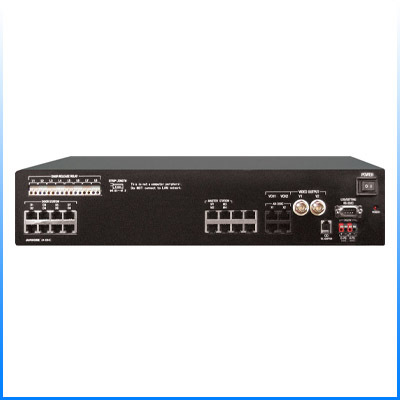 The AX-084C is a Central Exchange Unit for the AX Integrated Audio & Video Security system. Audio/Video and/or Audio-only Master or Door Stations connect directly to this unit via homerun CAT-5e wiring and RJ45 jacks. The AX-084C supports up to 4 Master Stations and up to 8 Door/Sub stations. The AX-084C can be expanded in increments of 32 for up to 104 Door/Sub stations with the use of AX-320C add-on CEU’s. The CEU handles the calling and communication signals for the system, as well as providing selective door release outputs, video outputs, DVR trigger outputs, and CO line transfer output. System set-up and a variety of functions are programmed in the CEU with the use of the supplied software. Power is applied directly to the CEU via two PS-2420UL power supplies. The serial connection is for uploading the system programming, for raw RS232 data output, or for system monitoring via the supplied program. The unit can be surface mounted to a wall, desk mounted, or mounted in a standard 19" EIA rack using the supplied mounting brackets.